Select an app that is appropriate for your child’s age group and individual needs with the help of his SLP. Your child’s SLP may already be using an app in speech therapy; if so, using the same app at home will help reinforce the lesson. Work with your child to complete each activity on the selected app. Doing so allows you to build a better understanding of his skills and the areas that could use some improvement. This is a pretty inexpensive app ($0.99) for younger kids. Developed by Scholastic Inc., the app follows the adventures of the Big Red Dog. Kids can select the correct letters to form three-letter words. When they spell a word correctly, a picture of the corresponding object will appear. This helps reinforce the association between the word and its meaning. Parents should take note that the app only offers 115 words. For best results, use this app as a springboard to transition into other apps that offer a more diverse vocabulary selection. This app is intended for children ages 3 to 10. Once your child outgrows the Clifford app, give this one a try. At $2.99, Spell & Listen Cards is a bargain. It offers 550 vocab words that are categorized into levels of increasing difficulty. This app helps children learn words and phrases by vocalizing the term, displaying a corresponding image, and offering a selection of letters. Children can touch the letters to form the word, after which the app vocalizes the term again to reinforce the lesson. Children can replay the spoken term at any time by touching the completed word. This app also offers a definition of the term. After completing each set of 25 words, children earn a star. Word Magic ($0.99) is intended for children ages 3 to 6. It’s a simple, fun game that offers brightly colored images. Most of the corresponding word is spelled out beneath the image. 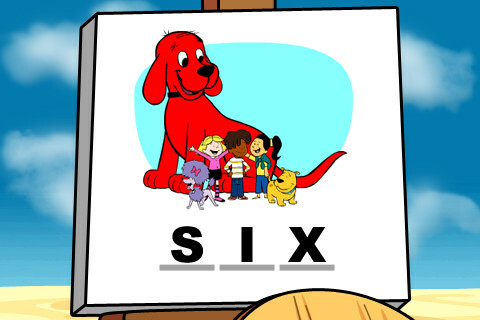 Children must select the appropriate letter to fill in the blank. Reviews indicate that a voice praises the child after each correct answer; however, it appears that the correct word is not spoken. For best results, parents should verbalize each word before and after the child solves the problem. Textropolis is intended for children ages 10 and up. This app has the appearance of a fun, casual game, making it an ideal app for older children who are feeling a bit rebellious toward the flashcard routine. Reviews praise the brightly colored animations and the simple design of the app. Kids move through cities, completing levels by discovering new words, learning definitions, and correctly arranging letter combinations. Some reviewers indicated that the app is prone to crashing, but because it is free it’s worth a try. 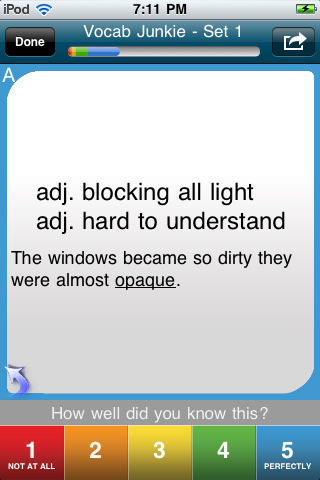 Vocab Junkie ($1.99) is an app intended for older children, judging by the name of the app and the sample vocab word (opaque). Vocab Junkie uses drills rather than games to teach over 800 vocab words. It offers definitions and sample sentences to help reinforce the lessons. 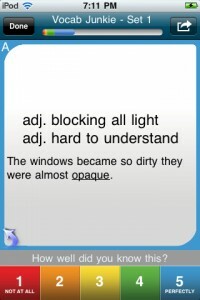 It also offers word element flashcards for roots, suffixes, and prefixes. Kids can track their progress with the statistics tool.